Participants interested in presenting their recent work, either through an oral or a poster presentation, must submit an abstract. The abstract should be written in English and the authors should choose at least one topic from the list of topics the workshop is addressing. The submission should be made through the Conference Tool, completing the submission form that requires the text of the abstract in plain text, as well as in an editable file format. A template for the abstract is available here. Following the acceptance of the abstract and your registration at the workshop, authors are welcome to submit full papers to the European Journal of Remote Sensing (EuJRS). Each submitted full paper of the workshop participants will be considered for publication in a Special Issue of the EuJRS entitled “UAS for mapping and monitoring”. The EuJRS has an IF of 1.5 and is an online and open-access journal. EARseL will be subsidising 50% of the authors fee for the publication of the full papers in this special issue. Due to a special agreement the participating authors have to pay only € 150 per paper. The papers will be reviewed following the peer review process rules of EuJRS. Accepted papers will be published as soon as possible. All full paper submissions to the EuJRS must be received by October 31, 2018. 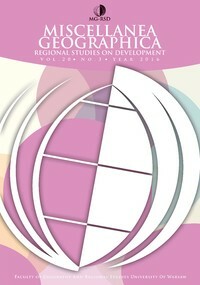 Following the acceptance of the abstract and your registration to the UAS Workshop at the Conference Tool, authors are welcome to submit full papers to the international and cross disciplinary open access journal ”Miscellanea Geographica ” (https://content.sciendo.com/view/journals/mgrsd/mgrsd-overview.xml). “Miscellanea Geographica” has been indexed in the Emerging Sources Citation Index (ESCI – Web of Science) and Scopus. Free Publication: “Miscellanea Geographica” will waive Article Processing Charges (APC) for the submissions from the UAS Workshop. However, if there is additional charge, like English editing, authors need to pay for this or ask native English speaker colleagues to help. Get lates information about EARSEL events. Insert your e-mail adress and get newsletter every week. Created by Beneficio Media, s.r.o.